So while Vongfong was the big weather story a few days ago – when it reached intensities close to Haiyan’s last year – it is now down to low category 1 intensity, and forecast to weaken further before reaching Japan. In the meantime, a new tropical cyclone has formed in the Bay of Bengal, strengthened dramatically, and is now in the process of making landfall in Visakhapatnam, Andhra Pradesh, on the east coast of India. The peak winds are estimated by JTWC at 110 knots, a high category 3, nearly category 4 cyclone. This has the potential to cause great destruction. The image at top shows the most recent enhanced infrared satellite image of Hudhud, taken from CIRA. Here is a recent story in the Guardian reporting that “hundreds of thousands” of people are being evacuated, and a story in Slate by Eric Holthaus. As Holthaus notes briefly in his story (and more on twitter) the India Meteorological Department has estimated Hudhud’s intensity at much lower values than other agencies have; IMD currently is calling Hudhud a 90-knot storm as opposed to JTWC’s 110). But the mass evacuations attest to the seriousness of the Indian government about this storm. Cyclone Phailin, last year, was similarly powerful, and also was the subject of dispute between IMD and foreign meteorologists, with the IMD calling the intensity lower in that case as well. The preparations and evacuations for Phailin were remarkably successful, keeping the death toll very low by historical standards. Hopefully the same will be true this time. 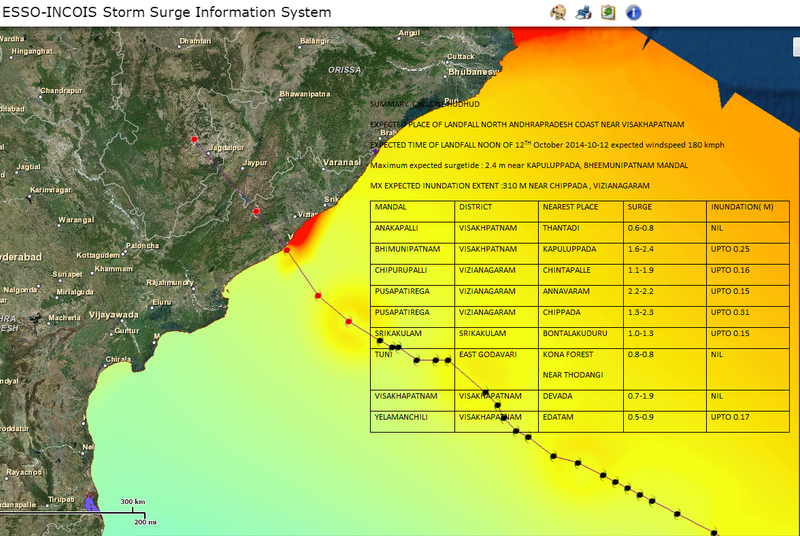 Here’s a surge and inundation forecast from IMD, predicting peak values in the 2 meter range for Visakhapatnam. This entry was posted in Extreme weather, Hurricanes, Storm Surge, Weather and tagged Hudhud. Bookmark the permalink.